The Segmented Crawbster (ゴロムシ?, lit. : "Grounder Bug") is a boss in Pikmin 2. It is the boss of the Cavern of Chaos' final sublevel (10), which is located in the Wistful Wild. This is the only place where it can be found. This crab-like creature has one large arm, and an exceedingly smaller left arm. It also has a rather thick shell protecting it. This creature rolls after the active leader, occasionally crushing Pikmin with its hard shell. If it crashes into a wall, it can cause boulders to fall. It will then struggle to get back up in an upright position, and while doing so will expose its weak spot: its flashing underbelly. Eventually, it will then get back up and swing its large arm around back and forth two or so times and continue its assault. In order to defeat this creature, it must be lead into a wall while it is rolling. Its rolling is more focused on the active leader, not the Pikmin. There is a slight chance that eggs will drop along with the boulders; these may contain Mitites, sprays, or nectar, and they will usually continue to drop every time the Segmented Crawbster crashes into the walls. After the boulders have fallen, the leader needs to be on either the left or right side of the creature and must throw his Pikmin onto its underside. After enough time has passed, it will get up and swing its bulking arm, which can't kill Pikmin, but does knock off their flowers. Once defeated, the Segmented Crawbster will groan and squeal as it is underbelly explodes violently, spewing goo particles all over the immediate vicinity, before dropping the Silencer. In terms of which Pikmin are the most effective for defeating the Crawbster, it is advisable to use a group of around 10-15 Purple Pikmin – they must have flowers so they do not lag behind and get crushed. Care must be taken if one is to use them, as if they have lost their flowers due to the arm attack, they will surely be crushed by the roll. However, if few/no Purples are flowers, flower or budded Red Pikmin can do the job, as they have average speed and the second strongest power in the game. A group of 15-25 Red Pikmin is a good number to attack the Crawbster with. Using ultra-spicy spray is advisable since it makes the Pikmin very fast, making it easier to avoid the rolling, especially for Purple Pikmin. The spray effect lasts for about two assaults. Ultra-bitter spray can also be used to delay the end of the Pikmin's attacking time. The falling rocks land near the active leader, so leaving a leader outside the arena and switching to them whenever it hits a wall is a good tactic. For a speedy completion, the player can dismiss 100 Pikmin near its backside right after it falls from the sky, and then get ready lure it into a wall, away from the Pikmin. Once it hits the wall, the Pikmin that were chasing after it should start attacking at a steady pace. The name "Segmented" comes from the fact that its outer shell is made up of several segments that allow it to bend its body. "Crawbster" is a combination of "crawfish" and "lobster". In Japan, it is called ゴロムシ?, where ゴロ? is "ground ball" or "grounder", which is a baseball term given to a ball that rolls along the ground, and ムシ? is "bug" or "insect". This name refers its ability to roll along the ground. Its scientific name is Parastacoidea reptantia. In it, Parastacoidea is the same word as a real world superfamily that includes species of freshwater crayfish, and reptantia is similar to the Latin reptare, which means "to crawl slowly", perhaps referencing how it non-rolling method of movement is to crawl quite slowly. Internally, this boss is called dangomushi, which in Japanese is だんごむし? (lit. : "Pillbug"). French Rampaille Segmenté From ramper (to creep); segmenté means "segmented". A Segmented Crawbster in the Piklopedia. A petrified Segmented Crawbster being attacked by Purple Pikmin. Olimar throwing Purple Pikmin at the Segmented Crawbster. The Segmented Crawbster as seen from behind. The creature's e-card, #29 (12th blue card). 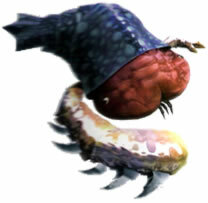 The Segmented Crawbster cannot be brought to use his rolling attack in the Piklopedia, for it only chases after leaders. When it crashes into a wall, it may cause some embed glitches to occur. When it falls down on the tiled floor in the sublevel where it is found, pieces of tile will fling from the impact; however, even in the Piklopedia, where no tiles are found, it will still show tiles flinging from its fall, as they are a part of its impact animation. The Segmented Crawbster is the only regular boss to not be found in the Pikmin 2 Challenge Mode. It is also the only boss that Louie cannot be seen with. This page was last edited on December 2, 2018, at 03:31.